Paula Makaikis is ashamed of her marriage. Driven out of their bedroom by Roger's compulsive hoarding, she has spent the past ten years sleeping downstairs on her husband's ratty couch. Distant and uninspired, Paula is more concerned with the robins landing on her office window ledge than her hard-earned position at the university. Until a phone call changes everything. A homeless Greek man is dying in a Queens hospital and Paula is asked to come translate. The old man tells her of his beloved dog, Fotis, who bit a police officer when they were separated. Paula has never considered adopting a dog, but she promises the man that she will rescue Fotis and find him a good home. But when Fotis enters her life she finds a companion she can't live without. Suddenly Paula has a dog, a brand-new Ford Escape, an eight-week leave of absence, and a plan. So Fotis and Paula begin the longest drive of their lives. In northern Minnesota, something compels her to answer a help-wanted ad for a wildlife rehabilitation center. Soon Paula is holding an eagle in her hands, and the experience leaves her changed forever. An inspiring story about fate, family, and healing, this novel explores what is possible when we cut the ties that hold us down and the heart is free to soar. 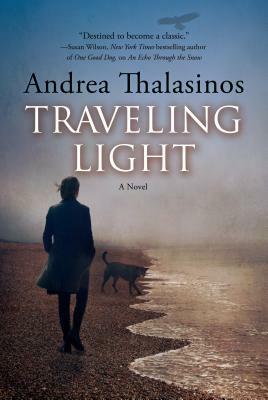 "Traveling Light" by Andrea Thalasinos is an inspiring story about fate, family, and healing. ANDREA THALASINOS, Ph.D., is a professor of sociology at Madison College. She is the author of An Echo Through the Snow, an inspiring novel that combines her longstanding passions for dogs, nature, and native peoples. Andrea lives and writes in Madison, Wisconsin.